Meeting on Hurricane Rita cleanup exposes many controversies, including whether FEMA contractor Jeffrey Jones may have overrepresented his authority to speak on FEMA’s behalf. Two years ago, we presented a feature entailing contractor Billy Broussard, who was threatened with FBI prosecution and placed under a restraining order prohibiting him from making public records requests of the Calcasieu Parish Police Jury and Calcasieu Parish Gravity Drainage District 8. We followed that feature up with 16th JDC Judge Ritchie lambasting Attorney General Jeff Landry’s legal skills by stating, as backed up by a copy of the court transcript, that Broussard should follow a television commercial and “choose your attorney carefully” next time rather than utilizing Jeff Landry’s services. Attached are documents that speak for themselves but it makes it clear that when the State (auditors) were kicking back the documents that were not adding up to the FEMA PWs, the individuals involved were orchestrating a plan of their own to satisfy FEMA reimbursements. In Mr. Stutes’ letter of 2/16/15, http://www.laboards-commissions.com/Stutes_FBI_Letter.pdf, he references having received “numerous complaints by Calcasieu Parish officials” entailing my requests for public documents. Those complaints are known to have originated from Ms. Kelly Fontenot, whom I believe I can firmly substantiate committed perjury under oath during questioning by me on March 23, 2015 when I was serving pro se and questioning her on the witness stand. 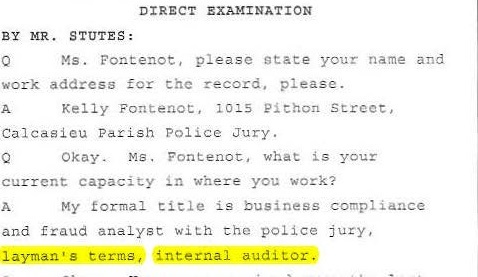 Fontenot described her position with the Calcasieu Parish Police Jury as, “Layman’s terms, internal auditor.”: http://www.laboards-commissions.com/Fontenot_Internal_Auditor.jpg. The reality is Fontenot knew darn well there was ineligible debris! How do we know this? Simple! 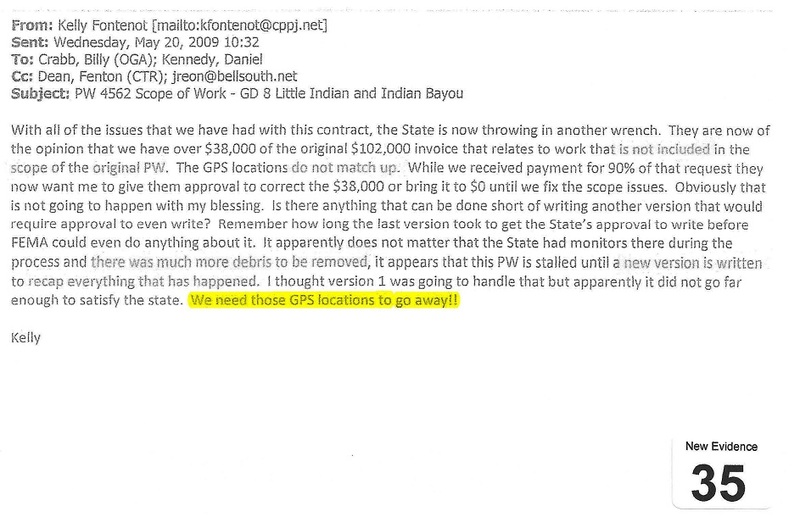 She sent an email on 5/20/09 to FEMA monitor Dan Kennedy stating, “We need those GPS sites to go away.”: http://www.laboards-commissions.com/GPS_go_away.jpg. 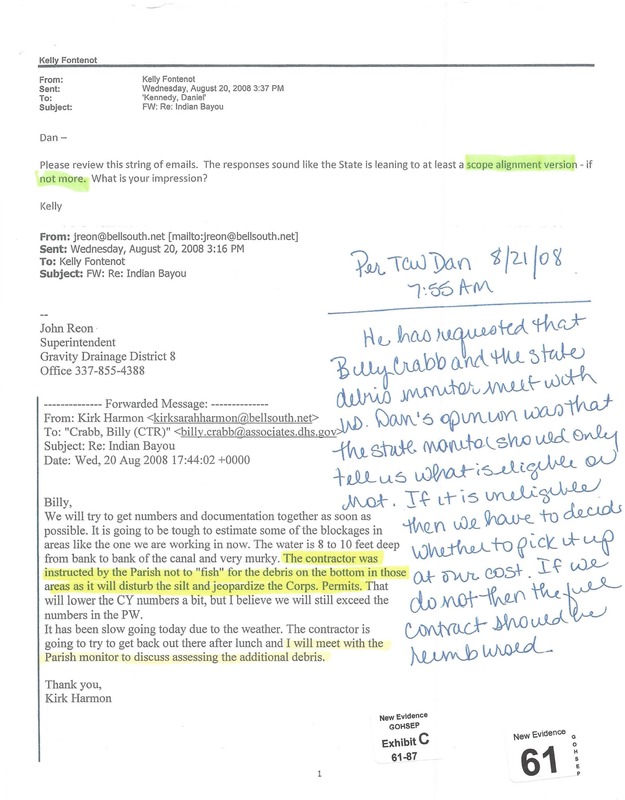 In an email of 8/20/08 again to Kennedy which has Fontenot’s own handwritten notation of the following day, 8/21/08, Fontenot states that Kennedy has indicated that, if I was directed to pick up debris that was ineligible (nobody even disputes that I was so directed), it would be at “our cost.”: http://www.laboards-commissions.com/GDD8_will_pay.jpg. One really cannot conclude any other scenario but that Fontenot is utilizing her own audit knowledge and skills to, at best and being kind, be deceitful to FEMA!! I trust you will find the preceding linked documents to be quite compelling in buttressing what I have stated now for years. Rep. Blake Miguez (R-Erath) sought a meeting with Louisiana Legislative Auditor Daryl Purpera to discuss Broussard’s concerns. Yesterday, Wednesday, February 6, 2019, that meeting was held. A controversy arose soon after the meeting entailing one gentleman on the roster, specifically Jeffrey Jones. As clearly depicted on the preceding link, Mr. Jones owns a consulting company, JLJ Consulting Services. It, in turn, has a contract with Fluor, and Fluor has a contract with FEMA. In other words, contrary to the perception which was prevalent in the room, Jones is NOT a FEMA employee notwithstanding him clearly representing himself throughout the meeting as “FEMA,” with the common perception he was a staff member of FEMA. Robert Burns contacted several experts on the subject matter of Jones’ ability to participate in the meeting. One expert with another Federal agency at which Burns used to work emphasized that Jones should have been clearly identified as NOT being a FEMA employee and rather that he is a contractor with FEMA. It was further indicated by that individual that the full-time FEMA employee, Alice Joffrion, should avoid any instance of imputing Federal Government employee status upon Jones by having him be the lead person in responding to questions (i.e. she should only lean upon him for support rather than defer to him). Instead, as will be evidenced in the 17-minute excerpt from the meeting in the video to be presented below (which focused only on Jones’ commentary throughout the meeting), Joffrion repeatedly deferred to Jones. In reality, it was Jones and not Joiffrion who responded to virtually all of the questions posed by Congressman Clay Higgings’ Lafayette Field Office Representative Jerod Prunty. He also responded to a question by Sen. Fred Mills, who was joining the meeting via conference call. Finally, Burns was told it’s inexcusable for the FEMA employee and the FEMA contractor to provide conflicting guidance, yet that’s precisely what happened in the video below entailing whether or not FEMA will reimburse for debris removed outside of the Army Corp of Engineer’s Wetland Permit. 17-minute video clip of “FEMA” representative Jeffrey Jones at a meeting of the Legislative Auditor’s Office of 2/6/19. Note: Rep. Miguez is seated at the FAR END of the table on the RIGHT-hand side furthest from the camera. He is the one with the beard, and the two “FEMA” representatives are between him and contractor Billy Broussard. The Legislative Auditor’s Office meeting of February 6, 2019 is certainly not the only time that Jones’ status has been the subject of a ton of FEMA money and confusion thereof entailing eligibility for reimbursement. Given that every member we’ve asked who attended yesterday’s meeting felt that Jones clearly represented himself as a FEMA employee, we can only conclude that Jones’ representations regarding his FEMA status do in fact appear to be creating considerable confusion. Further, there is now an open question as to whether Jones was even proper in attending the meeting, much less the degree to which he responds to the questions in the preceding video in speaking for FEMA. 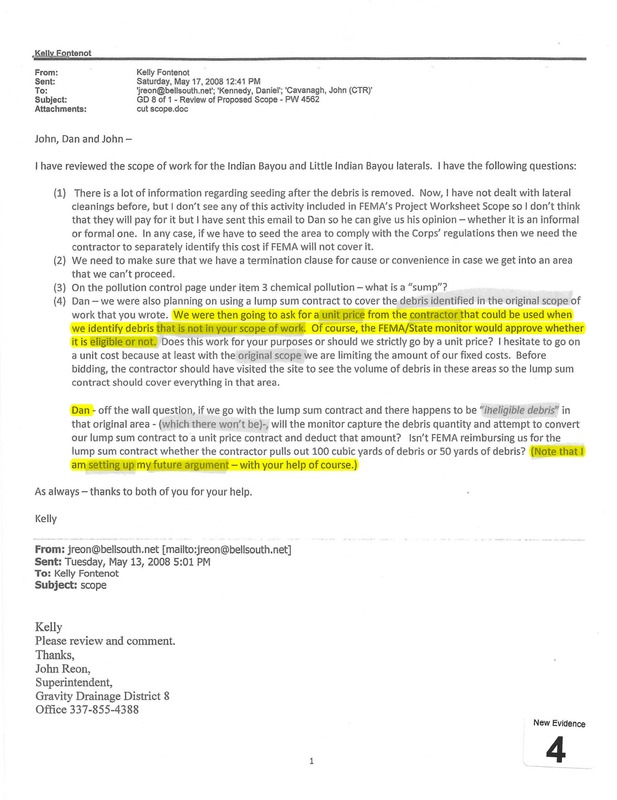 Given that Mr. Broussard has contended since day one that someone misrepresented himself as a GOHSEP employee and authorized him to do approximately 10 times the original work he was instructed to perform (along with an assurance that he would be paid for such work), especially when combined with emails wherein Calcasieu drainage officials are indicating, “We need these GPS sites to disappear,” we can only characterize the totality of all these circumstances as very disturbing from our vantage point. 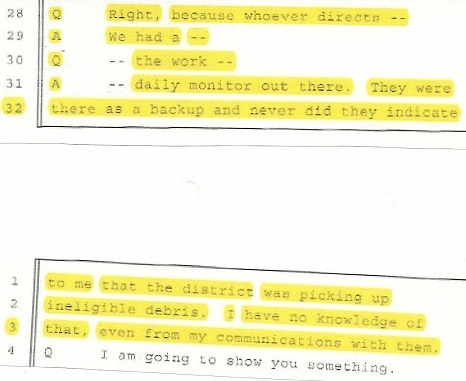 After all, if an entire room can be confused on Jones’ status and Fairburn, who held a prominent position with Livingston Parish Government was confused (resulting in substantial FEMA claims denials), then is a single contractor, Billy Broussard, supposed to be held to a higher standard than all of them? Louisiana Legislative Auditor Director of Recovery Assistance Services’ John Morehead makes it clear “FEMA” representatives are there as his guests. We again extend our sincere appreciaton to Mr. Purpera’s office in permitting us to videotape this very intriguing meeting! We look forward to delivering installment two of this intriguing meeting very soon! Congressman Higgins, you have a lot of constituents in Calcasieu Parish. I have sent you messages to look into this matter. Thank you for getting involved. There needs to be a full investigation of the police jurors and administration. There are other things going on with this police jury that needs to be investigated by an outside agency. Previous Previous post: Are Louisiana lawyers poised to elect ethically-challenged St. Tammany Parish CFO attorney Kelly Rabalias to an esteemed position on the Louisiana State Bar Association?